This is a super pistol. Also the finest of the four known Higgins pistols . 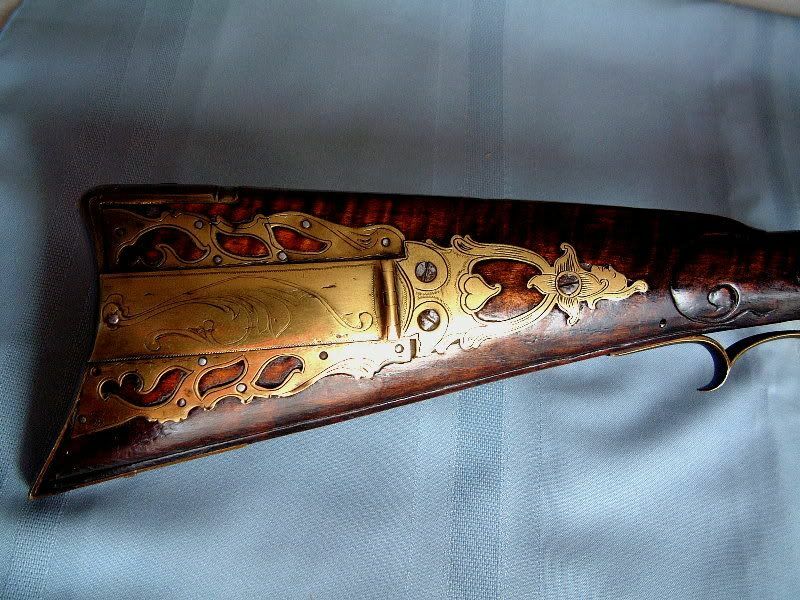 The only one with a cast trigger guard and gold trim......... Great museum piece. Just like XXXX said, and in a class by itself. This one makes you want to go throw rocks at all other KY pistols. If there was a finer workmam during the percussion period than Wiley G. Higgins, I've never seen his work. The Higgins pistol is superior in workmanship to many other pistols. However, it's importance goes well beyond its craftsmanship. It represents the best of our southern gunmakers who are not always recognized or given proper credit for their true abilities, due in part to the seemingly much reduced survival rate for their guns when compared to northern makers. When a southern gun, whether pistol or rifle, is found that truly shows the full capabilities of the better southern gunmakers, we all become better educated, and more appreciative, of what was being made below the Mason Dixon line prior to the Civil War. 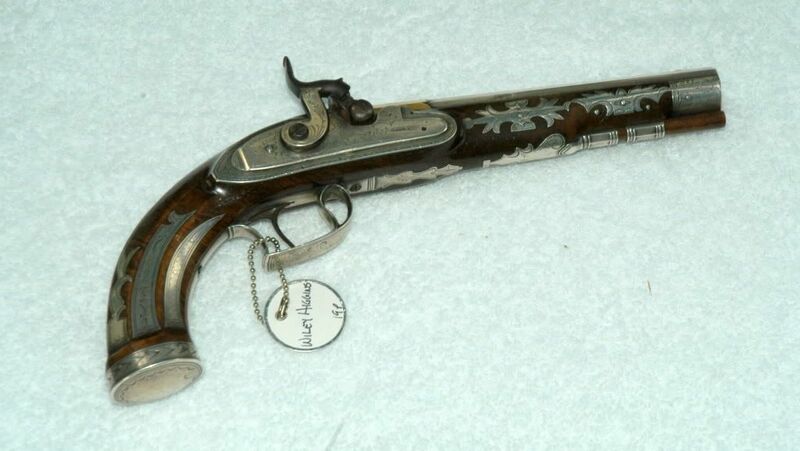 We see a number of southern "poor boy" guns, but many of those same makers that we at times discount, could upon demand produce objects of virtue comparable to the best that Pennsylvania, Maryland and the other northern states had to offer. One of the most enjoyable aspects of southern guns, such as this Higgins pistol, is the freedom and at times unexpected whims the southern makers used in designing their mounts, inlays, carving, and stocking. They were not as constrained, or burdened, by a strong obligation to work within the norms of the local "schools" as much as most northern makers were. Nor did they have the high art of towns like Philadelphia coloring their best work and telling them what quality should look like. The result was/is a freshness, a delight in the unexpected, and to me at least, the gift of a greater anticipation of what the next great southern piece will look like, moreso than with the better northern guns. In Memory of Lt. Catherine Hauptman Miller 6/1/21 - 10/1/00 & Capt. Raymond A. Miller 12/26/13 - 5/15/03... They served proudly.